In 2012 the character of Tarzan celebrated his 100th year in print. A serialized version of the story first appeared in 1912. A hardcover collection of Tarzan of the Apes first appeared in 1914. Being in the middle of the Tarzan centennial period it’s an opportune time to (re)visit many of the screen renditions of the character. Previous posts in this and other series can be found here. As I have referenced several times in the past, there was a time when I wandered away from Disney fare but alas I have come home. In looking back it lasted maybe a decade or so. Now, having been back I am occasionally catching up. Thus, having tracked down many Tarzan titles over the past two years revisiting many and parsing them out and finding what in each typically does not work for me I figured it was time to give Disney’s rendition of Tarzan (the initial one) a shot. As it turns out this film is a nearly unqualified success in both what it does in terms of telling a Tarzan story but also in its smooth manipulation of the standard Disney formulae. In terms of Edgar Rice Burroughs’ creation, as best as prior cinematic adaptations are concerned it distills merely one book, Tarzan of the Apes, and adapts that to tell its story. So far as Disney has been concerned there was no other blueprint to go off of because they were tackling the tale for the first time. With an opening that is dialogue-free, save for Phil Collins’ source music; the film begins rather quietly and powerfully. The connection established between an orphaned babe and Kala, a female gorilla who rescues him and raises him as her own. The technique of animation allows for more exacting and concise editorial decisions about what needs to be shown. Since there are no live animals, but ones constantly under control of the animators, the temptation of cutting to something for cute factor is gone. Clearly, cultural mores changed over time, but the fact that this film deals strictly in an origin allows it to convey characters on a more human level, and avoid pitfalls some past films faced. Interesting from a Disney standpoint is that the characters do not sing, the music is played as part of the score. There’s one moment of instrumentation but they are not anthropomorphic chorus members this time. Tarzan’s sliding about as if strapped to an invisible surfboard through jungle trees gets a bit trite but it does add a controlled kinetic element and makes him seem superhuman. Also a stumbling block that is overcome is that of language. 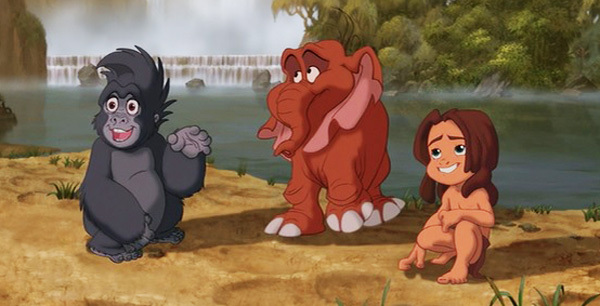 It takes some suspension of disbelief, but Tarzan and his family can talk to one another, but when he meets Jane, her father, and Clayton; he can only grunt at first and then he learns to parrot and eventually understand. This is well-covered with artful montages. By getting away from certain conventions that other Tarzan movies set, and spinning the tale a Disney way, while also tweaking certain expectations of a Disney film the road to success is already paved. In a pleasurable surprise, however, the film also does manage to tug at the heartstrings like most Disney fare does – more strongly here. Also, Disney flips the script on a template established in The Jungle Book. A successful restructuring of a given pattern can be a joy to watch, conversely a failure of such an attempt is difficult to deal with. Taking all that in mind, with so many other versions under my belt, and with the hallmark Disney delivery of the origin, this may be the Tarzan film I was looking for all along the one that combines adventure, emotion and the intrinsically fascinating things about this tale in one package. So, here we have another truncated bit of storytelling which renders this film quasi-cinematic at best. This film follows a somewhat different path to last week’s installment inasmuch as it was made at a far earlier date. Here again the producer is Sol Lesser. This time the company releasing it is a Poverty Row outfit. However, the tale is not structured out of the whole 12-episode run of the serial but rather just the first four. In addition to the 12-chapter serial, producer Sol Lesser edited the first four chapters into a 1933 feature film, with a trailer announcing future chapters at the theater weekly. However, some theaters did not show the trailer, causing confusion about the abrupt ending of the movie. The one positive note is that I was viewing the 86 minute British release which does give a much fuller account of the narrative than the 61 minute US film. That at least gives some sense of what it could be. Sadly, the serial version is considered a lost film. This is sad not just because any film being lost is a bad thing but because Buster Crabbe is at his best over a long format and may have had a chance to more firmly assert himself as Tarzan given the full intended scope of the project. This is another case of buyer beware and a good indicator as to why this film will typically be found in discount box sets. Too much further commentary is almost unnecessary as it feels the most robbed of a chance to be notable as my notes on the title were scant since I felt like I had watched this film before as it had that similar disjointed and incomplete feeling as the others that were similarly fashioned. Here, not entirely unlike last week, we have a feature film that was created by splicing together. Last week’s was created by cutting together a serial into a feature format. Here you have a proposed TV series that was turned into a film. Now this could equal if not better results than the former treatment, but the material here is quite odd. In many ways it feels as if episode one and two were a single storyline (i.e. a double episode) and then the third act/episode was a new story with similar players that was shoehorned in. Aside from story issues this also creates little gaffes in continuity. For example, Tartu, the name of Tarzan’s son in this tale (Rickie Sorensen) has two distinct haircuts and they jump back and forth over the course of three scenes. Now with these pacing and narrative issues clearly this is one that was going to fall low down the pecking order. This is also one I had seen previously. My initial rating was 3/10 and I was wondering why that was until it became clear there was a narrative break and structuring issue. If there is a lack of a link between episodes and no episodic structure to allow links to be built between episodes like, say Agents of S.H.I.E.L.D. did in season one; it had seemed like all cases were isolated then an overarching plot came to the fore. This, and many ventures in the 1950s, was produced by Sol Lesser. 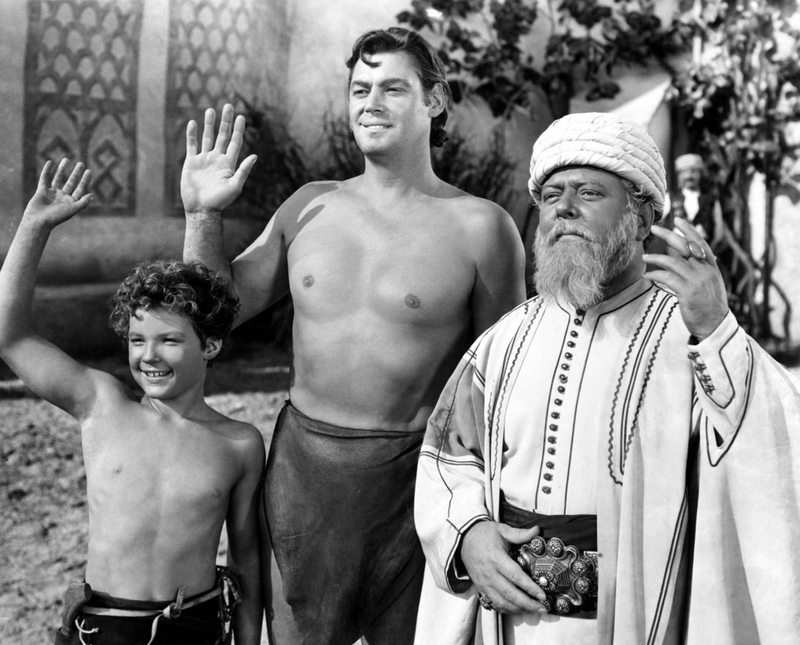 Lesser was involved in many Tarzan titles among many other films. The call is not entirely dissimilar to MGM’s, this is another story that deals with Tarzan against animal trappers (granted there are only so many avenues these tales can take). This environmental angle has new angles these days and could play well in a newer version (moreso than treasure which this also touches upon). This Tarzan played by Gordon Scott, is a more literate version and closer to Burroughs initial intention. This film also returns Cheetah the chimpanzee to the series. Scott was a star in a slew of Tarzan’s. His build is better, but his acting, at least in this one, seems as stiff-acting as ever. I would gladly look into a designed feature to try and dispel that. In this tale there is next to no stasis and lots of presumptive givens about who these characters are and what their backstory is and it dives straight into the adventure. This can be a positive if the narrative is strong enough which it is not. While I recently have discussed how TV has become more like film over time this is a clear example of how they are not interchangeable. While there are minute elements that are more appealing here like lack of stock footage cutaways, many bigger elements and production value issues (like the fighting and wasting Scatman Crothers) cannot be overlooked. This is, not unlike many of these Tarzan films, is a composite serial. This is actually the first topic I wrote about on this blog, not a “blockbuster” topic to tackle but it was a buyer beware kind of tale. What happened was I got a serial I loved in a condensed version, which I didn’t want, but I also didn’t know such a thing existed. Since then I’ve only gone into such ventures knowingly. This film is a shortened version of the 1935 serial The New Adventures of Tarzan. The opening voice over narration cuts through at least one chapter (15-20 minutes) of the serial story. This was apparent before the IMDb confirmed that this is composed of chapters 2-12. Cutting through the stasis straight into the thick of things makes identification and investment in these characters, and joining this world a chore. This is a film, and its serial predecessor, was produced by Burroughs-Tarzan Enterprises. This was a Poverty Row outfit that was created to create a truer film version of Burroughs’ character. There are some decisions to me that seem odd based on other versions, but it’s hard to tell how effective this would be in its serial form, which is an entirely different beast. This film with Herman Brix does feature a more literate and eloquent Tarzan than most, though perhaps not the most ever; it also features a far more in shape Tarzan than many of these films have at times. I could continue nitpicking things like the call, which is unmusical and amelodic here. What’s most curious is that the setting is cited as Guatemala and filmed near Tikal but the ecosystem, in zoological terms, is still quite African. One of the more interesting techniques this film presents is that it employs sped-up film cleverly in a naturalistic fashion to aid the fight choreography. This and other composites lack the cliffhanger aspect that are the trademark of serials. This makes for fairly abominable pacing. Ultimately, it’s hard to grade. The original serial exists and it may be interesting to visit. If you page through the Poverty Row Studio books you’ll find an entry for a studio established by Edgar Rice Burroughs to bring his characters, mainly Tarzan to the silver screen the way he saw fit. Surely, Burroughs (and his estate) was not the only author ever dissatisfied with screen versions of his story, but a reason for that could be the proliferation of poor films made. Disregarding “accuracy” many of them are just not good and highly disposable works. This particular version though produced by Sol Lesser, who was the architect of many of the character’s onscreen incarnations, was a Fox release. There’s not a lot in Tarzan’s Revenge that stands out as unique and most of it stands out as being so in a bad way. Hunting is a major plot element, and the goal of the hunt is to trap animals for a zoo. Being at another studio there are some things that would have to be different: the love interest is Eleanor (Eleanor Holm) not Jane, the Tarzan call is different, the chimps is a quieter less insane version, and in its defense this Tarzan (Glenn Morris) is a bit more fit. However, many of the issues from the MGM-RKO titles are here too because conventions of the day were too easily obeyed. A map of Africa plays a significant supporting role, ambiguous native, excessive amounts of exposition, Eleanor being disbelieved, lots of swimming and gallivanting. However, there are things uniquely weird here: Tarzan is there but rather passive for a time, the battle for Eleanor’s affection is lame; the bottom line is that this is flat and unengaging. Last year the character of Tarzan celebrated his 100th year in print. A serialized version of the story first appeared in 1912. A hardcover collection of Tarzan of the Apes first appeared in 1914. Being in the middle of the Tarzan centennial period it’s an opportune time to (re)visit many of the screen renditions of the character. Firstly, Boy (Johnny Sheffield) is written out of this edition. “Boy is away at school in England,” Jane says to let the audience know. The problem with these writing-outs is they are paradoxically more interesting tales. Jane nursing soldiers; Boy being educated in the UK would’ve made interesting asides or cutaways. Thus, if you could’ve re-cast or convinced the actors to take smaller parts it would’ve been a great wrinkle to add to the tale. As it happened that was the only mention though, it was very much a writing out. Coincidentally, Sheffield’s only other steady acting gig was as a Jungle Man, named Bomba (another coincidence), whom he played as many times as Weissmuller played Tarzan. The issues with this last installment can be summarized by saying that the great Dmitiri Tiomkin’s score is the best part of this film. The smallest issues is that they’re rehashing the forbidden/secret society mold. As useful as it ends up being, there is a very long expository voice-over to start the film. It’s as if the whole production was a contractual obligation to everyone involved and Weissmuller and Joyce sought as little screentime as possible. Whereas previously a matte painting of the escarpment was a major reveal, as the series progressed it went further and further in mapping Tarzan’s environs and neighbors. Here there is a tracking shot across a fictional map to the island in question near the start. This is a highlight, which illustrates what a wasteful experience this really is in the end. The natives finally all seem to be “of color,” which is an amazing advance, and the heroics are helping the two star-crossed lovers from the island find each other again. So how can that be bad? Well, throw in a singing postman who seemingly just flew in from Latin America to sing really long “impromptu” songs about things he sees. No, this isn’t a Family Guy joke, this really happens in this film. This film doesn’t have a second stasis but it does follow a climactic sequence with a tremendous lull that’s a failure in editorial, tonal, score-spotting and any other number of ways. It’s major lag in the third act acts as false denouement and puts the exclamation point on the complete and total mess this final installment is. It’s rare to see what ended up being the last film in a series so definitively feel like one and so richly deserve to be one. So far as this group was concerned it felt this series was over before this one even really started. And unlike other three-film segments in the series there was no feeling of finality, this film just ended like it started suddenly. Probably the most unfortunate thing about Tarzan and the Huntress is that there are good things in the script, but there’s just not enough material. At times it seems like they only started with half-a-feature-length screenplay, elongated everything, shot cutaways and time-fillers to bolster the running time. One of the switches that works really well here is that the impending threat is introduced prior to the stasis, therefore, at the outset of the film there is greater promise than there are in many of the films. The stasis is thus leant and undercurrent of tension none of the prior ones have. What interferes with the success of this installment most is the fact that, here perhaps more so than any other film, it seems Tarzan is the only one with a memory of past interactions with white men in the jungle. Again Boy, whose youth and naivite are harder to sell the bigger and broader he gets; and Jane’s willing acquiescence to the desires of the civilized world are what causes a majority of the issues and strife. Conflict is necessary but considering how flip the trappers are it’s hardly necessary for them to be tricked so. Tarzan attempts diplomacy bowing to the King and they cross him many times. Now, part of the issues is the concept and the writing there’s a line of the “war taking its toll on zoos.” How? Air raids, I would assume, but it that really a justifiable reason to over-poach? The greed is now underscored furthermore the animals are usually respected greatly by Tarzan and his family so Boy giving away two cubs for a flashlight is the hardest turn of events to take in the series. The reason it feels like have a script elongated is that there is a stasis section in the middle of the film. Much like my sudden, un-segued shift to discussing it, such is that section to the flow of the film. The conclusion of the film is not unusual and similar to others, including the fact that it’s not really earned. The next film, and the last time Weissmuller played Tarzan, would break the mold slightly but not for the better. If there’s one thing you can’t really knock the Tarzan movies for is that they most definitely did introduce enough tropes, setpieces and motifs such that it did give the writers the flexibility to try and break certain molds from time to time. The issues usually stemmed from trying to juggle too much and being too inconsistent in the results as it pertained to these disparate elements. A few things change here in Tarzan and the Leopard Woman. For one we open on the other interest in this film instead of opening on Tarzan and Jane or Boy. In fact, for a few consecutive titles the opening shots were nearly identical (Boy riding an elephant). So here we learn of the Leopard people. Everyone assumes it’s a Leopard attack but we and Tarzan knows better. There is also introduced a native doctor whose now “civilized” who plays an antagonist role and a foil to Tarzan. However, there is also the character of Kimba, who is a far more active antagonist and more two-faced as he has most of the characters fooled throughout. The last time there was an additional young character was Bomba, but he ended up being fairly superfluous. Kimba is a fairly significant character and well-portrayed by Tommy Cook. The biggest boon to the film is that there is a different feel to it than other Tarzans without giving away too much of what happens in the latter stages of it. There’s a more insidious, subdued plotting by those who threaten Tarzan. The things that hold it back are similar to other films but those that set it apart are quite unique. It does hold some surprises and tension in the latter third that many of the titles that fall short do not. It earns a mark of distinction, if not quality, due to Jane tailspinning, time-wasting and the like. So after the last installment was a triumph here is where the series should excel again, instead it starts to falter anew. Sure after two successful (at least in financial terms) go-arounds without Jane’s character being present re-introducing her, even with the need to recast here, should’ve been a no-brainer. Only the recasting wasn’t done right. This is not to lay the entire blame on Brenda Joyce. She’s not terrible, but she’s mediocre at best, and certainly at Maureen O’Sullivan’s level. A majority of the blame though has to lay on the shoulders of the writers who through the course of Jane’s appearances in the RKO titles backslid her from being a progressive character to one who was nearly antiquated even in the 1940s. She soon began to become overly-trusting of the outside world and bowing to them too much, thereby defying Tarzan without good cause. This may have even worked if it was addressed; if Tarzan called her out. However, it was like a retcon, as if Jane was always this gullible about the world she willingly left behind and the writing of her character became even more unfortunate than the recast. This is difficult enough to swallow without combining it nearly on a film-by-film basis with Boy either consciously or naively making a mistake. Sure, the leads can be flawed but what it does is to an extent defangs the antagonists. They seek to trick and gain confidence where maybe a few more instances of strong-arming would’ve been more effective. I’ll grant some of those preferences are subjective, but what’s not as much is the importance of Act II and that’s where this film decides to do most of its time-wasting, which makes it a rather grueling viewing experience. What makes it worse is that it does waste some of the better elements of the film: there is an animal attack with great relevance, as opposed to the gratuitous ones in other films. 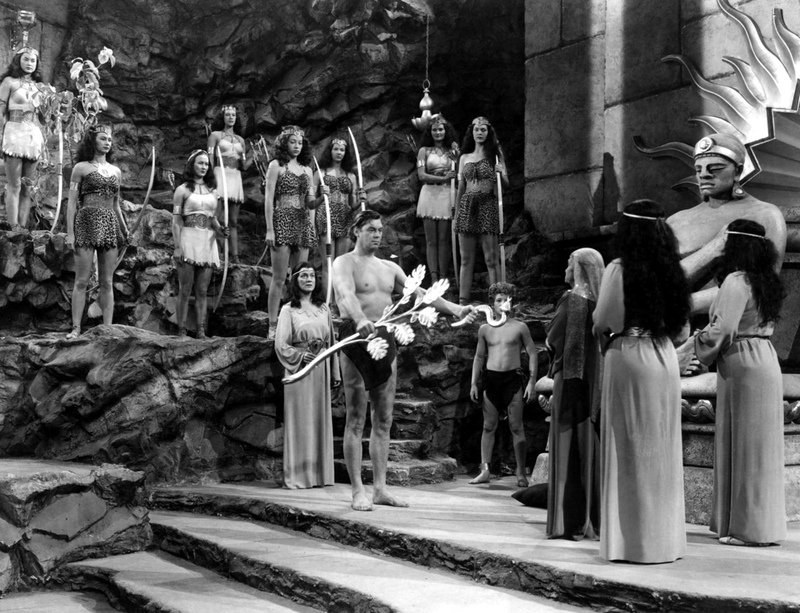 Johnny Sheffield, both in reciting Hiawatha and his conflict with Tarzan, delivers his best performance as Boy, and there’s the great Maria Ouspenskaya as seemingly one of the few playing a non-caucasian character in the film. All those things go for naught due to the missteps. I can’t fault the film for trying to create conflict, but when there are characters that are established acting somewhat out of sorts; it feels hollow. The best element of the tale is perhaps Tarzan that needed to keep a secret and not giving any clues as to the fact that there even is one, but even this becomes redundant as it’s discussed quite a few times with no progress made. It’s a good touch to have Tarzan an allied secret-keeper as opposed to an intimidating force, but, sadly this title has far too many failings. In many ways this was the title that inspired not only a chronological viewing of the Weissmuller titles but much of the impetus behind the entire series. I had heard good things about this and/or Triumphs so I was anxious to see this one a first time. Sure enough whether you come into the title cold, or you watch it in its rightful place in the series is a joyous revelation to behold. Not only does Tarzan’s Desert Mystery firmly embrace a B movie ethos here, and feel more firmly in an RKO mode than any other title, but if you follow the entire series it either repurposes tropes or uses them to maximum effect in this film. I lost track of how many times while watching it I saw a seemingly familiar instance or set-up not only followed-through, but done so in a beautifully satisfying manner. One of the main sins of the series that is rectified here is that it hardly wastes a second through the entirety of the feature. The late-MGM and early RKO films were shorter as a rule but still had the same fillers, not so here. Perhaps it was destiny that this was the one that would work the best since the initial Wiessmuller trilogy. The studio took a flyer on writing Jane out: she is still nursing wounded soldiers at war, but the MacGuffin (Yes, there’s a MacGuffin in this film) is a journey by Tarzan and Boy for medicine. One of the principal causes of wasted screentime in the past was Cheetah. However, in this film Cheetah not only comes to the rescue at a crucial point but is instrumental throughout. Rather than just being a kleptomaniac, and a bit of comic relief; Cheetah more frequently is an active participant in a Lassie-like mold and aids the heroes of the tale. With some subdued conflict this film also addresses the father-son dynamic of Tarzan and Boy fairly well. Boy’s lie here is that Jane insists he go on the trip, though Jane is instructing he should not. Boy being the one who can read tries to use that to his advantage. Tarzan, knowing Jane and what she thinks is best for Boy, tries to keep him home. Eventually Boy’s will wins out and that is a great thing for the film also as it doesn’t split time having him chase down Tarzan or getting in some other bit of trouble. They start out on the same footing as equals. Another massive boon to the film is Nancy Kelly in the role of Connie Brice. While she’s introduced in the only scene that feels it’s going to serve next to no purpose save for showing off a magic trick that, too, is quickly fixed. She plays the archetypal fast-talking dame and has other qualities that make her character, and her interpretation thereof, a wonderful addition to the film. The amount of intrigue she adds to the plot is spectacular. Not to mention that the conniving plots of the villains never really take a backseat and is always a real and present danger, and of impact in the story. Nothing is out of place in this film. Even when there’s something weird and seemingly frivolous like a seemingly poorly scaled rear projection image, a turban theft or a jailing, things are paid off left and right there’s clearly thought behind everything in the writing and the performances. Not only that but this movie is ridiculously fun to watch. It’s crowd-pleasing aspects drench it and still radiate off the screen to this very day. Having traversed the series anew my expectations were corrected, but even thinking back to where they (the expectations) had been this blew those right out of the water regardless. Can I claim it’s the definitive Tarzan film? No, probably not for a lack of Jane, but in latter-day terms of the Weissmuller era there was likely little if anything that could’ve been done to better it. It’s great and will likely stand as one of my favorite older films of the year.